Almost we all love to eat rice, especially variation in rise recipes are favorable. Irish Rice is such a great recipe to serve over weekend to the family and guests. 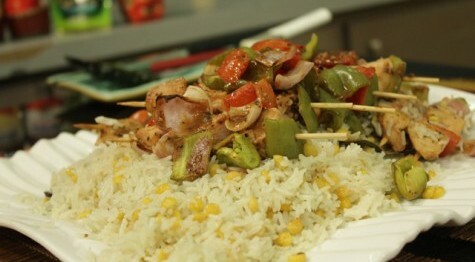 Serve this rice dish by Chef Zakir at weekend or special occasion. In a bowl marinated chicken pieces with tomato ketchup, soya sauce, Worchester sauce, salt, crushed black pepper and lemon juice. Cut 2 onions, capsicum and tomatoes into cubes. Thread marinated chicken in shashlik sticks alternating with vegetable cubes. Put shashlik sticks in a greased oven tray. Bake in a preheated oven for 15 – 20 minutes. Heat oil in a pan, add 1 chopped onion and sauté for few seconds. Now add bay leaf, star anise and cinnamon sticks. Sauté for 2 minutes. Add boiled gram lentils, soaked rice, salt to taste and water as required. Cook till rice cooked 80 % and water dries. Now put baked chicken sticks on top of rice. Cover with a little boiled rice and simmer on low flame for 8 – 10 minutes. Dish out in serving platter and serve.